A. Just one more year college football fans. This year is your final chance to say goodbye to the BCS! Q. When will the first BCS standings be released in 2013? What’s the rest of the release schedule? A. The first BCS standings will be released the Sunday following Week 8 action, Oct. 20. Bowl pairings for the BCS and non-BCS bowls will also be released Dec. 8. Q. How many conferences are there? A. After the Western Athletic Conference disbanded, we are left with six AQ conferences and four non-AQ conferences. Read more below. Q. What teams switched conferences this season? Q. What is this year’s BCS bowl selection order? You can find more information about the BCS bowl selection process at the BCS Bowls page. Q. What are the “automatically qualifying” BCS conferences? A. There are six AQ BCS conferences, thus named because the champions of those conferences are automatically awarded BCS bowl bids. The six conferences are the American Athletic Conference, Atlantic Coast Conference (ACC), Big Ten, Big 12, Pac-12 and Southeastern Conference (SEC). Q. What are the “non-automatically qualifying” BCS conferences? A. There are four non-AQ conferences, named as such because their champions do not automatically qualify for BCS bowl bids. However, one champion from the non-AQ conferences will qualify for a BCS bowl bid if they rank in the top 12 in the last BCS standings, or if a non-BCS conference champion ranks higher than any BCS conference champion ranked among the top 16. The four non-BCS conferences are the Conference USA (C-USA), the Mountain West Conference (MWC), the Sun Belt Conference and the Mid-American Conference (MAC). Q. When are the conference championship games? A. Conference championship games for the Pac-12, ACC, SEC, Big Ten, MAC, Mountain West and C-USA will be held during the last week of the college football season. Q. Where is this year’s BCS National Championship Game? A. 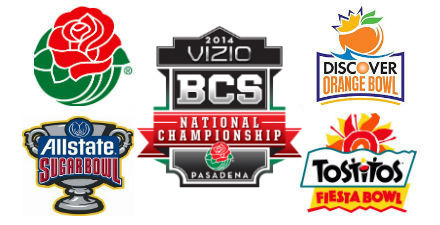 The 2014 BCS National Championship Game will be played in Pasadena, Calif. on January 6, 2014. 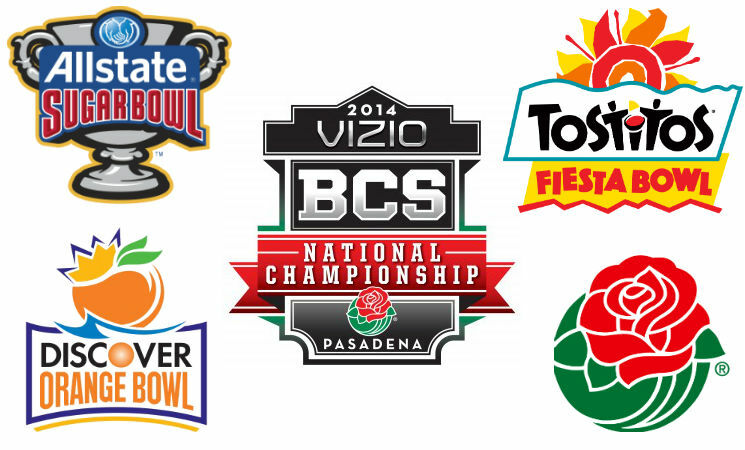 For a full bowl schedule visit the BCS and Non-BCS pages.